The Wolfgang Leather Care Combo includes the best combination of leather care formulas available in a convenient money saving bundle. Featuring the gentle yet effective leather cleaning power of Wolfgang Leather Care Cleaner along with deep penetrating Wolfgang Leather Care Conditioner, this winning duo will keep your leather surfaces looking like new! The Wolfgang Leather Care Combo takes the guesswork out of your leather cleaning and protection routine, and saves you money too! 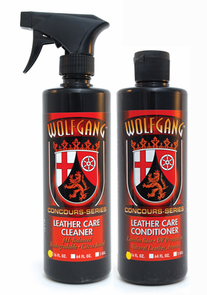 Protect your investment with the Wolfgang Leather Care Combo! A total retail value of $49.98 saving you $9.99!